To add up in our CloudFone collection, CloudFone Cloudpad 700w has been for sale since February 2013. Obviously, the name 700w which literally means 7.0 inch display. 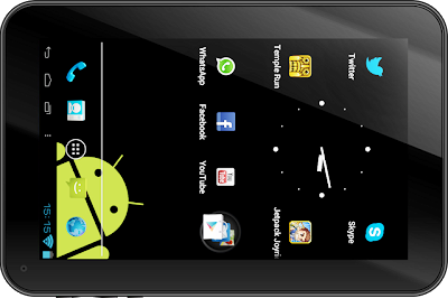 Powered with 1.0GHz single-core AllWinner A10 processor, and 512MB of RAM, Cloudpad 700w is priced at Php5,999. Also available for Phone + Tablet bundle at Globe, just be sure to check it out, since this is the cheapest plan you can get today. Going back to Cloudpad 700w, it is been confirmed that Cloudpad 700w has no 3D SIM slot, and one more confusing thing is that Cloudpad 700w has also no back camera. But with usb dongle support, using 3G USB Broadband is your final resort for portable internet connectivity, you can also count on WiFi, but its not available anywhere. Again, priced at Php5,999 SRP and available now in Globe Bundle with CloudFone Excite 320g, and of course at CloudFone Stores, Online Stores nationwide. CloudFone smartphones and tablets has been well known for their quality and durable gadgets, their monstrous battery is also a talk in the night, that includes our post today the "CloudFone Cloudpad 700w". CloudFone has been running in the Philippine electronic gadgets industry for a long time, and I never heard any customer complain for the time being. So, we can rate CloudFone products as GREAT!